2017 update: I am no longer working with an iPad (in fact, I no longer own an iPad). I’ve come to realise that the Mac is simply a better fit for my needs. I leave this article online for posterity. In 2016, ‘real work’ on Apple’s iOS platform is not only possible, but in some cases more comfortable than on OS X. 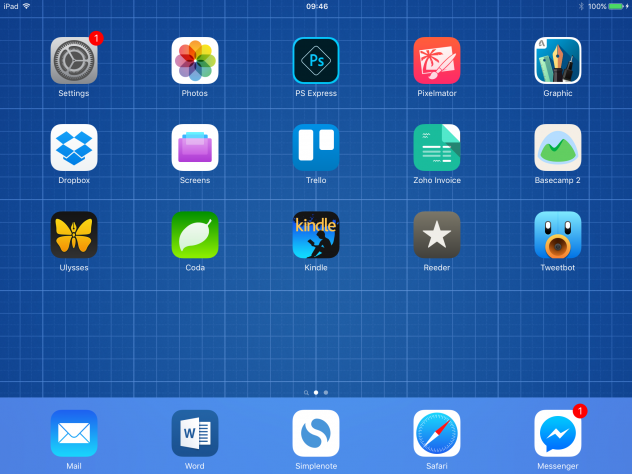 In this article I discuss how iOS 9.x has made my job easier as a freelance editor and writer. Three years ago, I composed one of the most popular articles on this website: A Tablet Computer as Writer’s Companion. 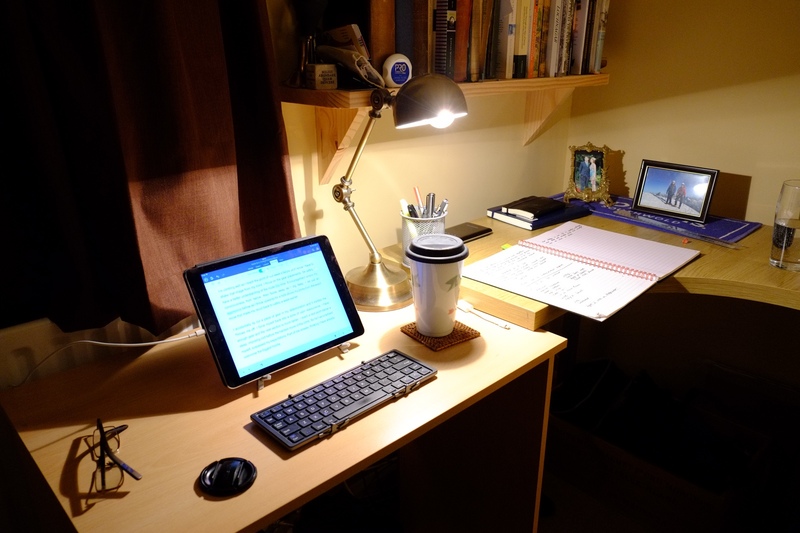 Tablets were very different in those days, but the premise of my article was that tablets aren’t just for web browsing and watching videos; with the right apps and workflows, they can be useful supplemental tools for writers. I used an Android tablet at the time but I also mentioned the iPad. In 2016, I’m glad to say, the landscape is dramatically different. Software is at last catching up with the capabilities of the hardware. But this article is not an account of how I ‘switched’ to iOS, because I still rely on OS X – trying to offload all of my computing needs to an iPad would be counterproductive. This is about how I use iOS to make my work easier. It doesn’t have to be either/or. For an overview of the rocky road that led me back to iOS, see The Great Windows Mistake of 2015. Before we begin, it’s important to define real work, because this is a subject that seems to upset some people when it comes to discussing the iPad and productivity. Obviously, everyone’s definition of real work will be different. Some people work with massive Excel spreadsheets and Access databases. Others design products in CAD suites or code websites. Some people are writers. There is no single all-encompassing definition of real work, so all I can really do is talk about my requirements, which – I believe – overlap with those of many others in my profession. I am a freelance editor and writer. I primarily deal with text all day long: creating it, editing it both for myself and for my clients, and publishing it in various forms. Photography is a growing part of my work. I also collaborate with a wide variety of people, manage projects, and do all the other little administrative things freelancers have to do. When the Mac was in its early years, it was a shrine to simplicity and ease of use. I can still fire up my Macintosh Classic from 1989 and marvel at the small but perfectly crisp monitor, the intuitive menu system, the way each application filled the entire screen and let you focus 100% on your work. But as more and more features piled in, the Mac experience became more complex. Today the Mac is extremely powerful and capable of performing any task, but it is far less intuitive than it was twenty or thirty years ago. The iPad is evocative of those early Macs. The screen is actually a similar size. I happen to think about 9-10 inches is a good size for focused work with text, and even when I use a large desktop monitor on my Mac, text windows tend to be about this size. The iPad has a fundamentally different approach to window management: programs are either presented full-screen, or (optionally) two apps at once. I’ve found that working with full-screen apps is a huge advantage for the kind of work I do, because the iPad becomes my work; there are no other screen elements vying for my attention, and the system gently encourages me to focus on what I’m doing instead of letting me do everything at once. It’s just a page of text in front of me, and if I feel like procrastinating there is nowhere to hide. But if I need to refer to another document or a web page, iOS is now capable of showing a second window on the screen. It’s the best of both worlds. What about the actual hardware? iPads have the advantages of portability and adaptability. A laptop is not only difficult to use on your lap for long periods, it can’t be used in other situations where an iPad excels, for example held upright like a paperback book, or lounged back on a sofa. An iPad is just a screen that contains your work. After a while it starts to feel like a page, freed from the limitations of computer hardware. Even if you primarily work from a desk, this is incredibly liberating. We need to talk about software, because for many years iPads were rejected as serious work tools due to crippling limitations in this department. That situation is changing rapidly. Dropbox is the glue that binds everything together. I have been a Dropbox user since the service first launched, and have depended upon its reliability for many years now. Most of my work lives here. With iOS 9’s document picker and deep in-app linking, you can work with Dropbox files from pretty much anywhere. Very occasionally a syncing error can erase or corrupt a document, but thanks to a combination of Dropbox’s online version history and my own robust OS X backup routine, I have never been unable to recover a file. In short, I trust Dropbox. While Microsoft Word for Mac remains a buggy and frustrating mess, Microsoft Word for iOS is an absolute joy to use. I think it channels the spirit of the almost mythical Word 5.1 for Mac (the only Mac version of Word I actively enjoy using). It’s far simpler and cleaner to use than the OS X version, and it’s both fast and stable. 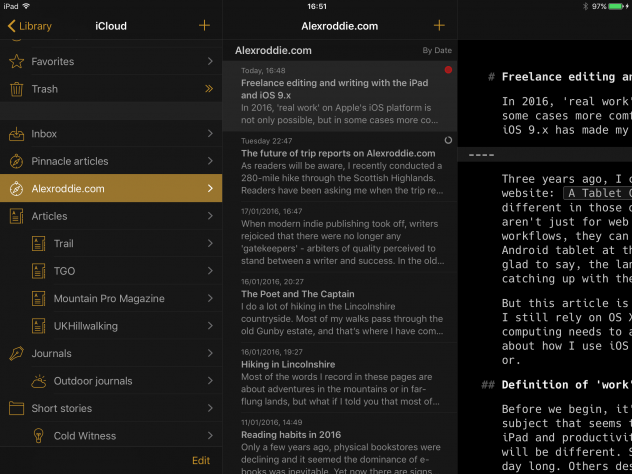 Although the iOS version does not have every feature to be found in the desktop version, it has all the features I need for advanced editorial work, including robust change tracking. Document editing in Word with tracked changes accounts for around 75% of my work. 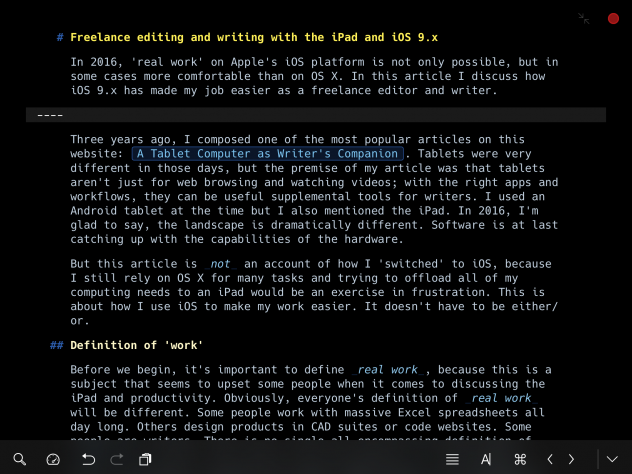 Word for iPad can handle this perfectly well, and due to the fact that it’s far more pleasant to use than the Mac version, with fewer bugs, I often prefer to do my editorial work here. Word in portrait mode. As you can see, it can cope with relatively complex documents easily. This document looks exactly the same as it does on Word for OS X. For my personal writing, I prefer to write in Markdown. 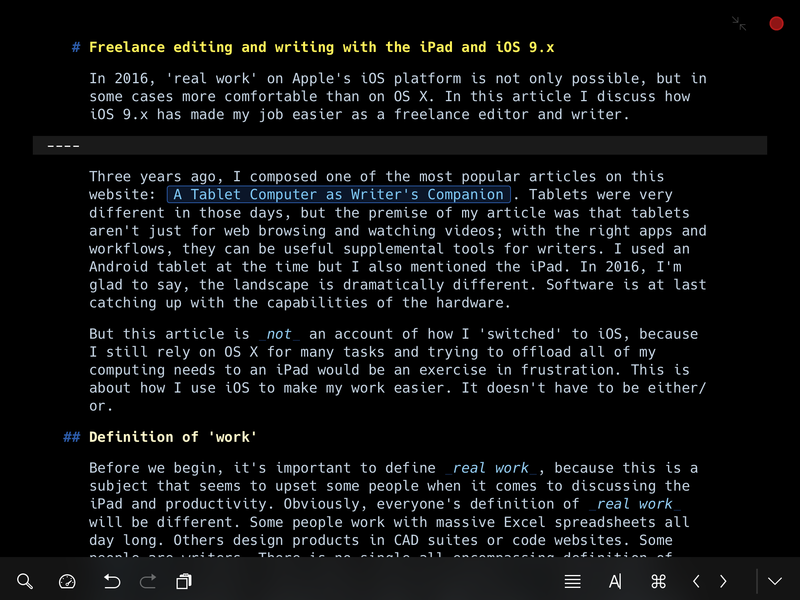 Ulysses is a modern Markdown writing environment with some similarities to the venerable Scrivener2. It stores Markdown files in iCloud; sync is fast and extremely reliable, and I’ve learned to stop fretting that my files aren’t all stored on a hard drive under my direct control. I have come to really appreciate the many options and tools Ulysses gives you: complete control over folder structure, fast Markdown notation, a best-in-class writing and editing experience, built-in document notes and word-count targets, plus a whole range of features I haven’t even tried out yet. Composing a sheet in Ulysses. The colour scheme can be customised by the user; I often prefer to write in dark mode. Note the extremely clear Markdown notation. The best feature of Ulysses is its truly excellent export tool. Ulysses can convert a Markdown sheet to Word .DOCX, HTML (full page or snippet), PDF, or EPUB. Preset export styles can be applied to change the formatting of your document. In a few seconds, I can convert a Markdown sheet to an elegantly formatted PDF, or a Word document with custom styles, or a basic functional e-book ready to upload to Amazon. This is huge. Only a couple of years ago, formatting an e-book would be a twelve-hour job involving manual HTML coding, conversion with Calibre, and extensive testing. Now it takes me about five seconds3. This is how I keep sheets organised in Ulysses. Again, everything here can be customised. Although personal longform writing lives in Ulysses, it isn’t the best app for simple note-taking. I often use my phone for quick notes, and my phone is an Android (no Ulysses for Android yet!). Simplenote running full screen. I don’t bother with tags or folders – I just have a flat stack of notes, and use search to find things. Works for me. On the iPad and on my phone, my Markdown notes synchronise to the excellent and reliable Simplenote service, which was one of the first players in this field and is still one of the best. Because I often need instant access to this note stack when working on my Mac, and because I still like the security of having my notes backed up to a local drive, my Mac runs nvALT 24/7. nvALT synchronises both to Simplenote and a Dropbox folder on my local drive. This gives me the best combination of accessibility and security, and is close to the perfect system for me. When working on my iPad, the small right-hand multitasking window is usually set up to display Simplenote, which I can summon at any time with the right-to-left edge swipe. It’s rare that I need to use any other app for multitasking. Simplenote running in ‘phone mode’ in the multitasking window. In practice, this is how I usually use Simplenote on the iPad. My blog runs on WordPress, but the iOS WordPress app is merely OK; I often prefer to use the web interface instead. I tend to write all my blog posts in Ulysses then copy the Markdown over to WordPress. I’m really looking forward to the upcoming Ulysses 2.6 release which promises to include native WordPress publishing. Photography is a minor but growing part of my job. In my role as an outdoor writer, I have to take and process hundreds of photos from my trips to the hills. Due to iOS’s limitations in handling raw files, and other drawbacks, the iPad is not yet the best tool for serious photo editing, although it can be a useful companion device. I try to simplify my photography workflow as much as possible. For non-critical work (personal photography, or most photos destined for the web) I like to shoot raw and process a JPEG in camera to avoid too much time spent editing files on my computer. 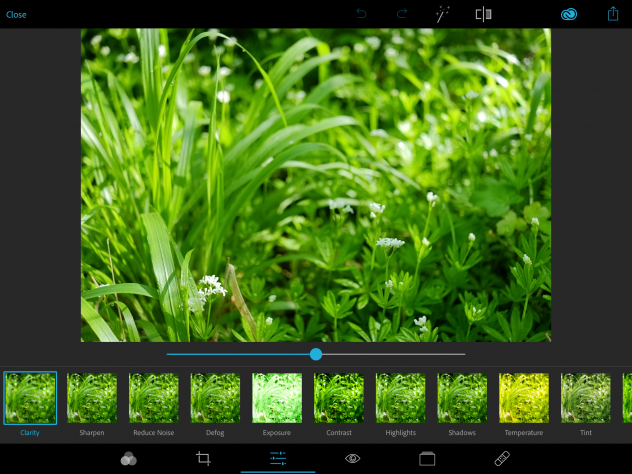 Anyone dealing purely in JPEGs can get by just fine with only an iPad, although you will need to experiment a little to find the best workflow. I don’t use Apple’s Photos service; I file photos directly in Dropbox5 and edit in Photoshop Express, which is a decent iOS photo editor. It can even process raw files at full resolution, although not as well as Lightroom or Adobe Camera Raw on the Mac. Until fairly recently I was editing in Photogene 4, but it hasn’t been updated since 2014 and has issues with iOS 9. Photoshop Express isn’t perfect (no support for curves, no histogram!) but it does offer reliable highlight and shadow recovery, white balance adjustments, sharpening, noise reduction, and other essential tools for raw processing. Adobe can do a lot better here. As we’ve already seen, other developers are treating iOS seriously and building software with similar capabilities to desktop equivalents. Modern iPads are more than powerful enough; why can’t we have a fully featured version of Photoshop or Lightroom for iPad? The current version of Photoshop Express gets the job done (just about), but I wouldn’t rely on it for professional work. Editing a raw image file in Photoshop Express. 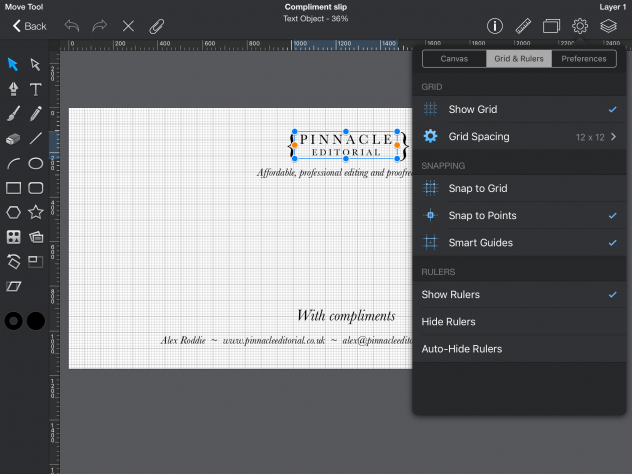 Pixelmator and Autodesk Graphic are truly excellent tools for other graphical tasks. Pixelmator on iOS is now powerful enough for highly advanced work including designing book covers (it can also be used for JPEG photo editing). Graphic is the best vector design tool I’ve used on any platform. I don’t use these apps often, but they are indispensable when I need them. Creating stationery in Autodesk Graphic. It’s a highly advanced 2D CAD program and I will never even need a fraction of its capabilities. What about when I’m processing images destined for print? I can’t comfortably do this on iOS yet. Although processing raw photos is possible with Photoshop Express, it’s far more efficient (and the results are far better) doing it the old-fashioned way with Adobe Camera Raw on the Mac. I don’t use Lightroom so can’t comment on that, but I gather there are serious limitations in how it handles raw files on iOS. My hope is that Apple will address this weakness in the next version of the operating system. Occasionally, I need to edit or create HTML documents. Although Ulysses does a fine job of converting Markdown to HTML, it isn’t the right tool for editing web pages or Kindle source files. Panic Software’s Coda is the best programmer’s text editor I’ve found for iOS, and for my limited purposes it’s just as good as any editor I’ve used on the desktop. Editing an e-book source file in Coda. When clients send me PDF documents for proofreading, Readdle’s PDF Expert on the iPad is the tool I prefer to use. Again, the iPad’s physical format, like a page you hold in your hand, is great for this; it emulates the experience of holding a page of hard copy. PDF Expert’s markup tools are as good as or better than the tools you’ll find in Preview.app (which is what I use for marking up PDFs on the desktop). As I write this, I believe PDF Expert has just been updated to provide stylus support on the iPad Pro. Finally, for project management and team communication I use a combination of Trello, Zoho Invoice, Basecamp 2, and the built-in Mail app. When I started Pinnacle Editorial I used Excel spreadsheets for everything, but these are cumbersome and require too much fiddling for my tastes. I like to keep track of my projects with a Trello board, and Zoho Invoice has dramatically streamlined my invoicing and accounting system. Many of my clients prefer to communicate via email, which the iPad can handle perfectly well (yes, including file attachments! ), but the Sidetracked team uses Basecamp. The iPad app is often a better experience than using the web app on the desktop. I don’t use a digital calendar or to-do list, and still prefer to use a paper planner for everything short of full-blown project management. I use a 16GB iPad Air 2 (WiFi only), which I purchased last year. Although the 16GB storage capacity can feel very limiting at times, I manage by not storing any media locally and using the cloud for everything. When I eventually upgrade this iPad, I will almost certainly buy a 128GB iPad Pro. I have two keyboards. One is the Filco Majestouch 2, a fantastic mechanical keyboard that has been my workhorse for a long time now, both on the Mac and the iPad. 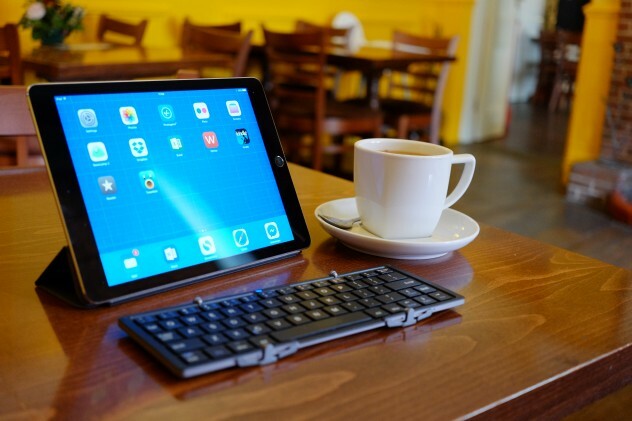 The second is a very small folding Bluetooth keyboard I use when I’m away from my office. I don’t like or use Apple keyboards. Apple Lightning to USB 3 Camera Adapter. This is a powered USB adapter that I use for connecting my keyboard to the iPad. It can also be used for importing photos from my camera (although the iPad Air 2 is unable to take advantage of USB 3 speeds). Note that when you import photos this way you can only actually use the raw files in Photoshop Express; every other image editor I’ve tried only opens the JPEGs, and there is no way of seeing the raws and JPEGs as separate files in the built-in Photos app. You can’t even delete one without deleting the other. This is a frustrating limitation in iOS 9.x. It’s also very frustrating that you are unable to view images at anything larger than thumbnail size before you import them. Photo transfer and management on iOS is due a major overhaul and this is the big reason why professional photographers are not yet using iPads. iPad Air Smart Cover. The only case I use for my iPad. It keeps the screen covered and doubles up as a very handy folding stand, usable in two positions. It attaches with magnets so is easy to detach when necessary. RAVPower NAS Filehub. This is an extremely versatile piece of hardware. I use it when I need to process raw photos on my iPad; you can also use it to obtain direct file-system access to things like memory sticks and hard drives, although in practice it isn’t as fluid as the Finder on OS X and I rarely use it for these purposes. It’s a useful get-out-of-jail card in the event I have to access a USB stick away from my office, though. Twelve South Compass Stand (original). This is the metal tablet stand I bought six years ago for my original iPad. It was expensive at the time but it’s extremely stable and I tend to use it in combination with my mechanical keyboard at my desk. When out and about I just use the Smart Cover as a support. I have a couple of other cheap plastic stands which work almost as well, but the Compass has a bit more stability and also elevates the tablet at just the right height. Smartphone with data plan and tethering. My iPad is WiFi only, so when I need to use it out and about I tether it to my smartphone. In reality I use my iPad at home most of the time so this is not as inconvenient as might be expected. Road warriors will almost certainly require an iPad with built-in 4G. Most obviously, you get a built-in keyboard and pointing device. A laptop running OS X or Windows will have a traditional file system and access to a full range of traditional software. It’s much easier to multitask on a laptop. You’re probably much more familiar with working on OS X or Windows, and familiarity can result in a faster and more efficient workflow. Depending on the work you do, it may be easier to work offline on a laptop than it is on a tablet. If these reasons are enough to keep you using a laptop, then fair enough – I’m not going to try to persuade you, because there are still hoops to jump through if you want to try working on an iPad. Using a laptop is the sensible choice, but if you’re reading this then you are at least curious about using an alternative system, and maybe you’re willing to try something new. Maybe you have an iPad you use for entertainment and wish your work computer could be as simple and easy to use. Over the years I’ve found that, for my specific requirements, most of the perceived obstacles to working on iOS can be overcome by changing your point of view or just taking another look at long-established workflows – which is exactly what I did when I ditched my Excel sheets for Trello and Zoho Invoice, saving me a huge amount of time in the process. Freelancers should be very wary about becoming set in their ways. While laptops have built-in keyboards, they tend to be rubbish (yes, even Apple’s laptop keyboards) and the keys wear out very quickly if you’re a professional writer. Most writers will use an external keyboard with their computers anyway. And once you get used to the way iOS works, you’ll find that a pointing device is less necessary than you might think. With modern ways of working, a traditional file system is far less important than it once was. I probably have to transfer physical offline files about two or three times a year. What about traditional software? This is a legitimate point – some tasks still require OS X whether you like it or not, but the list of jobs I simply can’t perform on an iPad is shrinking every month, and the list of jobs an iPad can do better or more comfortably is growing all the time, as we’ve already seen. Again, I must stress that this will not be the case for everybody. As discussed above, multitasking can be overrated. Familiarity is overrated. If you’re old enough, you were probably once familiar with working on DOS and found graphical user interfaces frightening and cumbersome. Switching from Windows to Mac requires a similar period of adjustment. It’s amazing how quickly people can adapt to new paradigms and workflows if there are benefits in doing so. When did you last have to work offline? If you do a lot of work on trains, or in cabins in the wilderness, I can see how this might be an issue but I almost never have to actually sit down and do my job somewhere there is no connection to the web. Besides, it’s usually possible to work offline on an iPad if you download the necessary files beforehand. It may sound like I’m being obtuse for the sake of it here, or making excuses for a limited platform, but I’m reminded of how it felt to be a Mac user back in the 90s and early 2000s. Even when I went to university in 2005, with a white iBook G4, very few of my colleagues used Macs and our development labs only catered for Windows users. Here’s the thing – because I believed in the platform and wanted to use it, I adapted and made it work. Over the last year, I’ve noticed a number of tech bloggers writing about how they have completely switched from OS X to iOS. It seems to be an idea whose time has come, and it appeals to the minimalist in me – but for my specific requirements it does not make sense just yet. I think we are at least three or four years away from the day when I can retire my desktop Mac. Formatting paperback interiors. In my line of work, this is the big one and there is absolutely no way of doing this on iOS – yet. Even if iOS Word could do everything the desktop version can do, I need a large monitor capable of showing 6-8 pages on the screen at once when I’m working on a paperback. There are also other niche Word functions that only the desktop version can do, for example rescuing a corrupted file or converting from an exotic file format6. Precision Kindle e-book formatting. As previously mentioned, many of my clients have highly specific requirements for formatted Kindle e-books. If a book needs advanced formatting such as embedded image links, specific typography or an in-line table of contents, I still prefer doing this manually. Although I can happily do all the HTML coding on iOS, there is no way to convert the HTML source file to a Kindle book – yet. This requires Calibre on OS X. I’m confident that I will in time find a simpler workflow that achieves the same results, however. Advanced photo editing and management. Right now, processing photos from raw just isn’t practical on iOS. If I’m processing an image for print then this has to be done on the desktop. My Mac Mini is set up to continuously provide automatic functions I rely on every day, such as filing photos in Dropbox, backing up my Simplenote stack, and automated Time Machine and SuperDuper backups. I am not comfortable relying purely on Dropbox without my own local backups – yet. Printing OS maps using the OS print-on-demand mapping service. It just about works on Safari for iOS, but it’s a pretty poor experience. The Ordnance Survey need to improve their iOS app to enable printing and fix a gazillion bugs. Accessing and managing my data archive stretching back many years, stored on several external hard disks. Much of this data is stored in older file formats that can only be opened on a Mac. While I could convert and transfer it all to Dropbox, it would be a mammoth task. Transferring information to and from my Garmin wrist GPS, iPod Nano, and vintage Macintosh hardware. Playing certain games that only run on OS X. And that’s just about it. Very rarely I will encounter some other niche task that can only be done on the desktop, but otherwise everything I need can quite comfortably be handled by iOS. I will always need a Mac if I want to keep using my older hardware mentioned in point 7, but otherwise I think it’s likely that every other point on the list will be addressed in the coming years. My typical desk setup: connected to mechanic keyboard and working in Ulysses. Would I ever want to completely switch to iOS? It’s a good question. I like the Mac platform, but I’ve come to see it as needlessly complicated for most of the tasks I expect a computer to perform. I would like to see iPads capable of using large external monitors7. It wouldn’t hurt to be able to use a mouse and an external hard disk, too, but I can’t say I really miss these things most of the time. Right now I still keep my Mac up and running 24/7, usually with monitor and peripherals connected. Sometimes I use my Mac out of habit; sometimes I find myself using my iPad exclusively for days on end, and just for the hell of it I’ll take away the Mac’s monitor and pretend the iPad is my entire office. I’ll find myself VNCing into the Mac Mini a few times a week using the Screens app, until the time comes when I need to edit a batch of raw photo files or format someone’s book, and then I’ll plug the monitor back in and use the Mac. I don’t see the need to force myself to use only one system or the other when both are good at different things. One thing’s for certain – I’m absolutely amazed at how far iOS has come in a very short period. I tried using my original iPad as a work device five years ago but found myself constantly hitting roadblocks, which led to me selling the device in frustration. Things have moved on and iOS applications are, in some cases, now better than desktop class. I think more and more people will start to realise that their specific requirements can be handled by simpler, cheaper, and physically lighter hardware. But I’m not here to force my opinion on anyone, just to open eyes to possibilities. If you work with words and own an iPad, give it a try. You might find it a pleasant surprise.